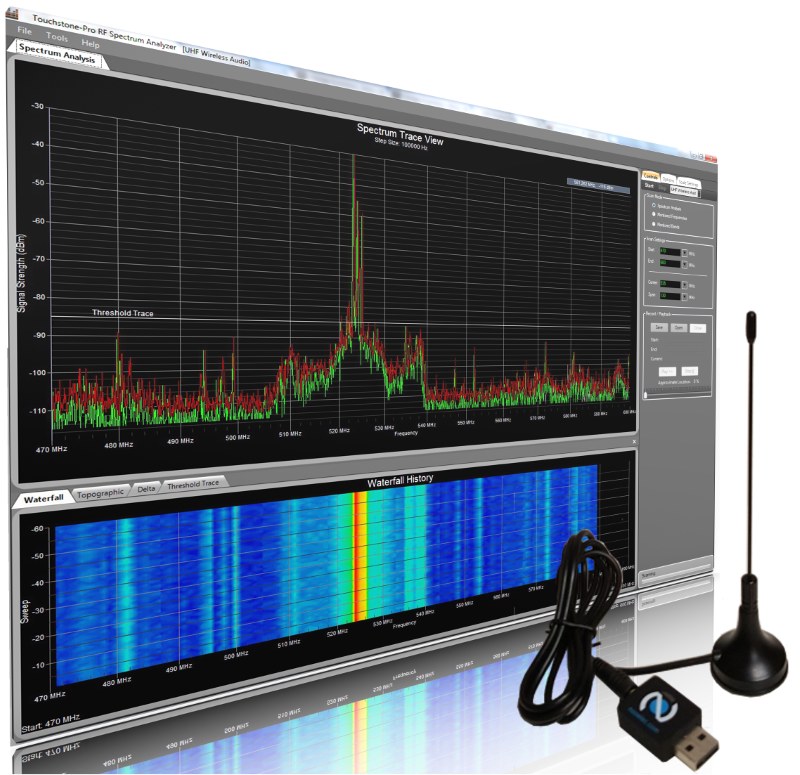 RF Viewer is a PC-based, RF spectrum analyzer that includes both hardware and software. It uses a wireless, USB dongle that interfaces with your Windows PC running Touchstone-Pro or Clear Waves data analysis software. The wideband, RF spectrum analyzer spans a frequency range of 24 MHz up to 1766 MHz, which makes it ideal for use in a broad array of RF-related applications. 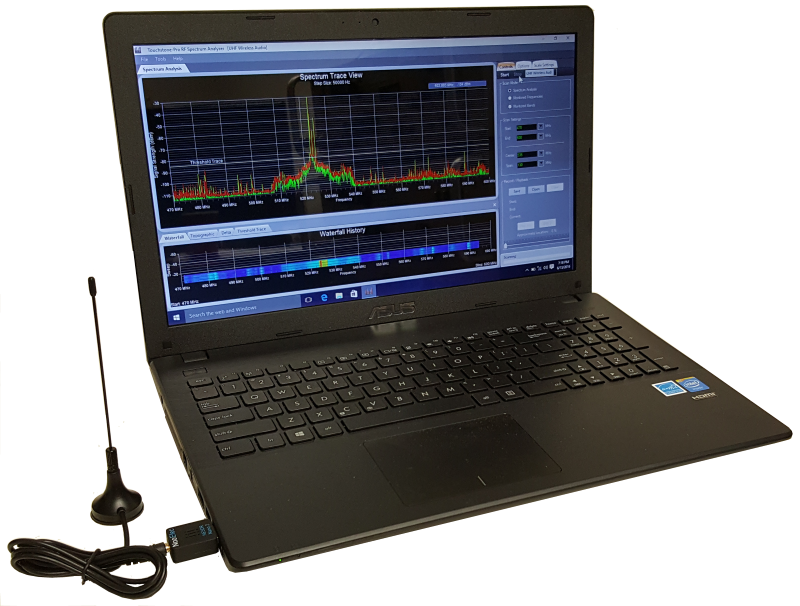 RF Viewer re-defines the mobile RF spectrum analyzer. The wireless DVB-T dongle is small and light-weight, and when combined with Touchstone-Pro or Clear Waves software offers performance and features comparable to larger, more expensive devices. RF Viewer employs a DVB-T dongle based on the Realtek RTL2832U chipset that supports a USB 2.0 interface. It can be used as a Software Defined Radio (SDR). The folks at Osmocom developed software to interact with the chipset and called it RTL-SDR. The Touchstone-Pro and Clear Waves software applications are installed as separate binary files, along with RTL-SDR binaries, support and license files. Nuts About Nets supports RF Viewer by developing PC-based software to enhance the functionality of the device. Both Touchstone-Pro and Clear Waves applications have been designed to work with the RF Viewer wireless dongle. Affordable: RF Viewer is a software plus hardware package that includes a wireless, USB dongle and either Touchstone-Pro ($79 USD) or Clear Waves ($325 USD) software. Portable: Light-weight and small in size, connects to USB port on laptop machines running a Microsoft Windows operating system. Data Interface: USB cable connects to Windows PC running sophisticated data acquisition and analysis software -- Touchstone-Pro and Clear Waves. Performance: Comparable to RF spectrum analyzers that cost many times more. Excellent dynamic range, sensitivity, and resolution bandwidth. Wide band coverage includes popular sub-1Ghz ISM bands, with maximum frequency reaching to 1766 MHz.